Print speed up to 175 cards per hour for front-side YMCK printing with front side lamination; up to 165 cards per hour for front-side YMCK printing, back-side K printing and front side lamination. 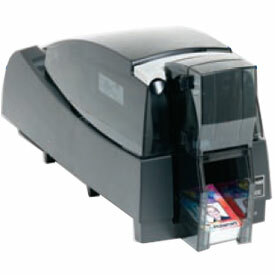 Lamination options are available for single and dual sided laminating. Front-side input and output hopper options include increased hopper sizes and security locks. Flexibility to upgrade the printer as your needs grow. 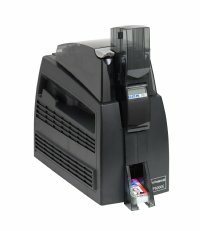 The P5000E is upgradeable for magnetic stripe, smart card, HID i-Class proximity card encoding and HID PC Prox. Customized supplies; auto ribbon ID, supply usage monitor, ribbon saver on monochrome, auto laminate and topcoat identification/validation. High yield ribbons and custom laminates available.